From the sweet chords of a guitar to the whizzing of a football. Share in real-time. Today’s sports and entertainment fans expect uninterrupted wireless service that allows them to quickly and easily stay connected with their friends and family while enjoying the live event. Updating social media, sharing photos and videos, sending texts and placing calls are integral and expected parts of experiencing a live event. However, stadiums and arenas present unique challenges for mobile and public safety communications due to their size, shape and wide variation in data usage. ADRF’s advanced in-building wireless solutions solve the unique challenges of stadiums and arenas to ensure spectators always have reliable connectivity. 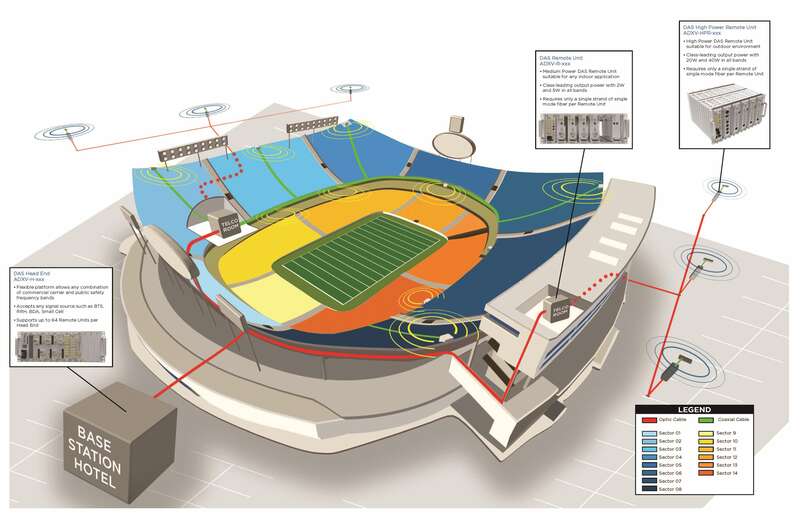 Using ADRF’s systems, stadiums can equip their security personnel and public safety first-responders with mission critical communication resources that support both cellular and public safety bands. There’s little down time at a bustling entertainment venue, which is why ADRF’s solutions are modular, flexible, and easy to install, ensuring minimal disruption. Our solutions can grow and change along with your structural or service needs, and allow you to have 24/7 remote monitoring and configuration. its surrounding properties enabling all attendees to share amazing performances with the rest of the world right from their seats. The Fox Theatre in Atlanta, GA is a historic venue built in 1929 that today hosts over 750,000 guests each year. ADRF was tasked with modernizing the wireless experience while preserving the original aesthetics of the theatre. The building retains much of its original construction, such as thick walls which cannot be penetrated by RF frequencies. Our team designed a unique solution for the Fox Theatre, implementing SDR repeaters and ADX DAS to overcome the antiquated construction standards to bring reliable wireless coverage to its guests and staff.